Distillery for management thoughts, ideas, and stories. Your employees and colleagues are usually just as busy as you are, so when you call a meeting, it is your responsibility to make it efficient so you can all accomplish what you need to do in the meeting and be able to get back to your other tasks. One of the best ways to do this is by designing your meeting intentionally, ideally spending more time in preparation for the meeting than you spend in the meeting. Use several strategies to make the most of your time during the meeting. Before calling a meeting, identify the core ideas you want to get across at the meeting. Boil them down to the need-to-know information for your team or the things you absolutely must brainstorm together. With each item on your meeting agenda, consider whether you could accomplish it more effectively through written communication or with a one-on-one meeting with a key person rather than everybody you were planning on inviting to the meeting. Given the topic of the meeting, consider who really needs to be present and who can sit it out without negative consequences. The fewer people you have at the meeting, the faster it will go. Plus, the people who aren't at the meeting will appreciate that you aren't wasting their time if you really don't need them there. List the specific people you need to have at the meeting and leave off those who won't contribute anything or who can get just as much out of the meeting by getting a quick recap from someone in the department who did attend. Go down the list of things you need to address at the meeting and plan how long to spend on each one. Add up the total time to help you determine how large of a block you need to schedule when you call the meeting. After you pick the time for the meeting, go down your list and write the time at which you need to start each section. This will help you keep the meeting on schedule as you are running it. Of course, you can deviate from the plan a little, but if you are going way over, be prepared to cut something from the agenda to show the others that you respect their time and commitments and are willing to end the meeting on time. Type an agenda for the meeting and distribute it to the people who you are inviting. In addition to the agenda, give them anything they need to read, study, or consider before coming to the meeting. Therefore, rather than explaining information at the meeting, you can just add any comments to the background they already read and studied. In addition, prepared attendees will have significantly fewer questions, and when they have questions, they will generally be well thought-out and important for the team to hear the answer to. Providing information in advance also gives your team time to think of any responses they might need to give to the prompts you will have. For example, if you plan a brainstorming session as part of the meeting, include the prompt in the background information so people can start thinking and come with their ideas rather than having to waste time sitting in silence at the meeting as they think. Start the meeting promptly, without any of the small talk or introductory material that is not actually essential for the tasks at hand. There is no excuse for a late meeting, and even if not everybody is present, go ahead and start on time. As much as possible, avoid the urge to recap the meeting for anyone who comes in late, which has the same effect as starting over from the beginning and makes the people who were there when you began feel like you are wasting their time. The people who attend meetings will quickly learn that if they don't show up on time, they will miss out on content. The most effective meetings are ones in which participants have to stay on their toes, not only listening, but also making their own contributions to the meeting. Design at least one portion of the meeting to be interactive, allowing people who attended to let their voices be heard on important topics. This provides a mental change of pace that helps them stay more engaged, in addition to giving you a short break from talking so you can mentally review where you are in the agenda. Having an agenda isn't much use if you follow every rabbit trail that comes up and end up talking about material that you didn't even plan to mention at the meeting. As much as possible, stick to your planned agenda and only cover what needs to be covered during this meeting. If other topics come up that you think are important, write them down on a piece of paper next to you. If your meeting looks like it will wrap up ahead of schedule, skim over your list and mentally assess whether talking about any of these items now would be better than saving them for a later meeting. Otherwise use the list of things that come up to help you craft future meeting agendas. Before leaving the meeting, write down anything you need to keep in mind going forward. For example, you might have assigned tasks to people and need to check up with them in a few days to get an update on their progress and gather information for your next meeting. The meeting also may have brought up things you need to discuss one-on-one with some attendees later. Are all parts of your project team on message? Are there teams within your project that go off message sometimes? In response to whether the company would have picked the logo selected for the 2012 Olympics, the answer was "probably not". What caused the stir was that this is the same company hired to be promote the 2012 Olympics. There are certainly some best practices that can mitigate such circumstances. Here are some excerpts from a recent Financial Times article – How do you prevent splits in a multiteam project? Sounds great and works, but don't underestimate the effort to accomplish this task. A lot of projects rush through the initiation and planning period, which is where this activity takes place. The enthusiastic initiators of a project can make a false assumption that other will get the mission as quickly and easily. Time and effort needs to be spent here by outlining key stakeholders and trying to understand 'What's In It For Them' (their needs). And then the message needs to be tailored to address their needs. Once you have a common mission, repeat it as if a mantra. Mike is right. Reliance on contracts alone to maintain the fabric of communications within an organization may not be the first best choice. Sure, contracts can be used as an enforcement mechanism, but culture and motivation have a role to play. And who is responsible to create culture and motivation, the leadership. It is absolutely critical that leaders within an organization always stay on message. How to build an effective team/organization? One way is for the Manager to take notes! I use it and I have seen it work. And if you are a manager reading this post, there is no better way for you to be on top of stuff and completely digest it. Survey after survey shows that meetings are needed, but waste a lot of time and resources. Although running effective meetings will be a topic for another series of posts, one way that you can build momentum on your team now is to have the manager take notes at the meetings. People will actually read them - Let's be honest, most people who attend meetings are not likely to read the minutes closely or for that matter at all. Now if the manager is taking the notes and sending them out, they are more likely to be read. They will be to the point – Minutes/notes for most meetings, especially status meetings (which on most teams are run by the manager), should really be 'Highlights'. I.e. I don't see much need to capture every single detail about who said what in a series of chronological bullets (there are exceptions). The most effective meeting notes are those that outline the key decisions, noteworthy points, and list of action items. These short and concise notes would be more useful. Promotes engagement - If the manager is capturing the highlights, it makes him/her more engaged in the conversation, which has a positive impact on the team's engagement, both at the meeting and outside the meeting. It's leading from the front. You as the manager will be on top of more stuff and the team would feel more accountable. Quick turnaround – I suggest that the manager send out the highlights soon after the meeting. If possible, within 30 minutes after the meeting. This reinforces the decisions and action items. Also, if there is an error or question about a point, fresh memory serves for quicker and more accurate corrections. I welcome your thoughts and feedback. And if there is another way your organization handles meeting notes, share that with everyone too. Are you the best for your customers? Note that I didn't say if you are the best in the world? I asked if you the best for your customers or said another way, are you the best for those you serve? There is much talk about being the best in the world at what you do. Doesn't that sound overwhelming? How can one instantly focus on being the best in the world at something that you may not have even started yet? And how do you measure if you have become the best in the world? The Best in the World? Anyone who is going to hire you, buy from you, recommend you, vote for you, or do what you want them to do is going to wonder if you're the best choice. Best as in: best for them, right now, based on what they believe and what they know. And in the world as in: their world, the world they have access to. You will not be overwhelmed trying to be everything for everyone. You will know and focus on your customer's needs. You will know who your competition is and what you need to do to get ahead. You can quantify and measure your success (almost instant feedback). Daniel Hamermesh makes an interesting point in his Freakonomics blogpost - Why Finding the Best Isn't Worth It. "Despite that, rational marital search, job search, or search for a high quality/low price product should stop when the gains from additional searches begin to fall short of the cost of spending the time and money searching and of giving up the pleasure of what you can already get". What we can learn from it is that grass on the other side may always look greener and we need to and can make the best with what we have. Don't stop looking for the best or striving to be the best, but don't let yourself and your organization get into analysis paralyses either. It's a fine line to walk, but intuitively you will know what the right answer is. Keeping an inventory of ideas and wishes for your organization can make you incredibly focused. I am a big proponent of keeping lists. They help us focus because we know that everything that needs to be done is captured some place and we can be reminded of all those items in an instant (just go take a look at the list). The same goes for organizations, there are lots of ideas and things that we would like to do, but can't all at the same time. These ideas and actions need to be captured in what I call The Organization's Wish List (TOWL). The idea of keeping the TOWL came to me through the intersection between the concepts of Brainstorming and Scrum (an agile project management methodology). Brainstorming: to get the most out of your brainstorming session, the group should throw out as many ideas as possible. Don't care about the quality of the ideas, just keeping putting them down. What you end up with is a list of everything possible, reasonable, impossible, and unreasonable at this time. Scrum: Scrum is an agile project management methodology introduced by Ken Schwaber. It primarily related to software development initiatives, but I use its best practices and principles in management consulting. The key concept that relates to TOWL is one of a Product Backlog. The goal is to keep an inventory of everything that needs to be done and add to the list as new items come up. Keep track of your organization's ideas at a centralized place. Create an opening for management and employees to engage. Promote creative thinking and problem solving within your organization. Allow for an optimal use of an organization's resources – during the ebbs and flows of workload, resources can be directed to work on a TOWL idea. This helps build and maintain momentum. The bottom-line is to keep your pipeline of ideas open and manage that pipeline as your business development and sales pipeline. You never know when the tide changes direction and you may have to consider new ways of doing business. Luxury vs. premium – so relevant to consulting too! Seth Godin's latest post on Luxury vs. premium is relevant to goods and equally relevant to services, especially as we see them in the context of the consulting profession. "Luxury goods are needlessly expensive. By needlessly, I mean that the price is not related to performance" – Admittedly I am small consulting company outfit, but have seem many a business deals go towards the big players (not to say that they are not competent, they are) just because the client prefers to have a big name on the cover of the report. It's not only the big ones, many small outfits price in a way that makes them look exclusive. Somehow paying extra (quite a bit extra) adds credibility. "Premium goods, on the other hand, are expensive variants of commodity goods. Pay more, get more" – now this applies to both large and small consulting companies. The customer is looking for a good end product, i.e. companies need to focus on excellence – making sure that their products and services are top-notch. And then and only then, do you get to charge a premium for it. So the lesson learned here is to focus on developing your services. Be a thought leader in your area of expertise. Work to build a reputation and focus on being Premium over Luxury. Our role as the facilitators of change is more important than ever! I co-chaired the CBODN Annual Conference on May 1st (Organization Development and Change: Helping Organizations Navigate Tough Economic Times) and it's clear to me that we are living in unique times. Indeed, these are tough times and times that require an extraordinary effort. But these times also present us with a unique opportunity, an opportunity to change the conversation. Ed Schein gave a thought provoking keynote about "What else is going on?" And Gallup (Richard Blizzard and Charles McClendon) gave a compelling presentation, showing the correlation between managerial focus on employee strengths and the employee engagement. Taking that a step further, we could see the quantifiable results of this engagement and how Actively Engaged employees (as opposed to Not Engaged and Not Actively Engaged employees) can make the difference to come out of these tough economic times. What makes our role as the facilitators of change more important than ever is the nobility of the OD and Change Management profession? It is our role to help individuals and organizations reflect and act in a way that changes the conversation. It's a 'job security' tactic, rather than 'being excellent at what you do' tactic. Just like Corporate Governance has been the big wave, Corporate Citizenship is becoming more and more important for organizations to maintain their competitive advantage. This concept is especially troublesome for smaller consulting firms (I have mostly seen it from a Federal Government Consulting point of view), where employees primarily act as the "pair of hands" consultants. It's a catch-22 situation where companies want their employees to be close to the clients (these projects can last years), but then comes a point where the employee's relationship to the corporate is just to collect the paycheck. Their daily interaction, direction, etc is all coming from the client or as some call them their "Client-Boss" or simply their 'Boss". Body shop mentality – the company provides the resources, bills, gets paid, pays the employee, and keeps the profit. 100% collocation – the consulting business often requires consultants to be on-site with the client, but when its years before the employee visits corporate because they have no business there, it's obvious to lose the connection. Who's in-charge? – employees suffering from this identity crisis will tell you that their employment is solely a function of funding for the project and how much their client likes them. Just a hard fact of the consulting business. Here is the issue – no one benefits from the lack of Corporate Citizenship. Granted it provides short-term benefit to those indulging in it, in the long run it leads to a tarnished integrity (its everything in the consulting business) and is the ultimate career-staller (it's a 'job security' tactic, rather than 'being excellent at what you do' tactic). Employers need to be responsible to put in place mechanisms that engage employees on a continuous basis. There are several ways this can be done. Employees need to act as good ambassadors for the corporate. Clients need to demand excellence from both the employer and the employee. It's the employers responsibility to train/develop its employees that in-turn become result-oriented consultants. If you have any questions or comments about this post, feel free to leave them here. I will get back within 24 hours. >> And if you are having trouble getting motivated to put in this work….remember (a) as a Manager it's your job to take care of your people; (b) Regardless of the outcome, you gain the most out of this situation. Tom Foster recently put up a question (When is Enough, Enough?) from one of his readers about when to lay-off an underperforming employee. You may want to read the post to get the context of the question, but my response below addresses the performance management question in general. My view is based on the Manager's role and our stuff that needs to get out of the way, especially with personnel decisions. - Seems like you are convinced that he doesn't get it and probably won't anytime in the future. You also mentioned that it is the same feedback you have received from others on your team. Well my first reaction is that intuitively, the person in question would also know this. Does he think that you are for him? Or just looking for ways to get rid of him? Would he trust you? - You are lending yourself as a victim to this situation. You want to do well as a new manager, would like to show productivity and profitability of your team, but you Manager is concerned about the consequences of firing someone. That's a tough sell. - Start afresh and give this guy the benefit of the doubt. Don't have any negative conversations about his performance with anyone, especially others on the team. If they want to talk, just say "now's not the right time for this". It's likely that you may have to dig yourself out of this hole. Is he interested in the work? What according to him will take to get his performance to acceptable levels? (He might say more time…and that's OK). Follow-up, with a need to build a performance management plan that will show incremental progress. Remember, there is always something you can find to measure performance. Have a weekly one-on-one meeting with him to review progress. Build trust with him. Really believe that he can make it. After doing this for at least 2 months, if the situation does not improve at all, I don't think documenting a lay-off would be the biggest problem you have. But if you do turn this around, think about the confidence you will gain in your managerial ability and the trust you will gain with others. And if you are having trouble getting motivated to put in this work….remember (a) as a Manager it's your job to take care of your people; (b) Regardless of the outcome, you gain the most out of this situation. "Sometimes bad things happen when good people are unlucky and sometimes scoundrels get away clean. Judging decisions based on their outcomes will wind up condemning too many unlucky people and acquitting too many scoundrels". There is lot of talk about the role of managers and leaders in decision-making. Drucker calls decision-making a "specific executive task". He goes on to say that "Managers are responsible for service results". Gino, Moore, and Bazerman in their research (No harm, no foul: The outcome bias in ethical judgments) found that "people judge the wisdom and competence of decision makers based on the nature of the outcome they obtain". The study presents a couple of convincing examples of how others may perceive your decisions differently based on the results. Although the study focuses on ethical decision-making, we see this sort of behavior apply to our daily and work lives every day. An executive makes a decision and if it is goes well, there is celebration, bonuses, and a band of fans…and if it goes bad, there is disappointment, Monday morning quarterbacking (I call it the waking up of the nay-sayers), and depending on how bad the consequences are, some people may even lose their jobs. "Often, the decision process is difficult to observe and so the only way we can evaluate a decision is based on its outcome", say Gino, Moore, and Bazerman. How do you react to decisions and their outcomes? How does your organization react to decisions and their outcomes? Does it foster a decision-making culture or are employees content in maintaining the status quo? In cases where a decision has unfavorable results, first give the decision-maker the benefit of the doubt. (It's like what my Org Behavior Professor said on the first day of class – "If this was the last day of class, your grade will be an A, now it's up to you to make it a B, C, or an F"). If you trust him/her to make a decision, then support them with the outcomes. Judge them based on the information available to them when making the decision and not on what you know now. Benefits and Concerns is a facilitation approach to help a group bring out their thoughts and opinions about the initiative right at the outset. This helps baseline everyone's position and lays the groundwork for finding common grounds among diverse opinions. If setting up and managing expectations is the corner stone for an effective management approach, then how do we do it when it comes to putting together a project with a diverse group of people, with differing management objectives and get them to agree on something. In your view, what does success look like? What will it provide (what is the benefit to the stakeholders)? In your view, what will come in the way? Open it up addressing the purpose of the meeting to embark on this new initiative. Most likely everyone would know it, but helps to confirm. What are the benefits of this initiative? What concerns do you have? Or what will keep us from getting there? (Here you might want to give an example or two…people need to feel safe to share…say something like: "here is something I can see coming in the way – we might not be able to get everyone to agree on a common approach". Go around the table and get this information from everyone. Take good notes and only talk if you need to clarify something…no opinions from anyone else other than person who is supposed to talk. By the end of this exercise, you and others in the group will have a good sense of where the group stands with the initiative. Now you are ready to start discussing the concerns, how they can be alleviated, while building a coalition around the benefits the initiative brings. Note: this process requires good facilitation skills, so do some reading and practicing before you first foray into this. Also, this by no means is the silver bullet to set up and manage expectations, but a tested tool. 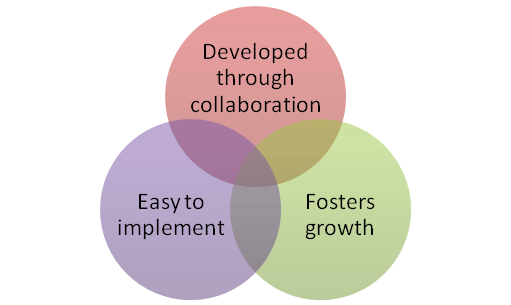 Developed through collaboration – stakeholders need to have a sense of ownership. This is especially true for the PM community, who will be the main consumers of our deliverables. Additionally, working in collaboration with your PMs (or middle management) will give you access to a lot more ideas and foster the culture of teamwork at the organization. Individual employee – there is a lot in this for the individual employee (a) They don't need to re-invent the wheel every time, which has a direct impact of their ability to deliver high quality work products, while beating their deadlines; (b) Learn new skills and approaches that are proven and repeatable; (c) Approach their work in a planned, rather than a chaotic manner. Program/Project Managers – in addition to the benefits they get from being an individual employee, a good management methodology is a basis for a high performance team. With this methodology, PMs will be able to (a) Deliver projects with a greater probability for success; (b) Provide project governance with defined roles and responsibilities; (c) Provide the basis for performance measurement – their own and their team's; (d) Set themselves up for performance awards, promotions, and engagement in special projects at the corporate level. Corporate (Executives and Back-office) – (a) Provide an enhanced governance structure based on clear communication and expectations; (b) Business development – not only as an aid for proposals but also a competitive advantage in precise delivery; (c) Future capabilities development via special projects that engage high-performing employees; (d) Provide an employee leadership/development track; (e) Shift dependence from individual employees to roles. Customers – ultimately our goal is to maximize profits, which is only possible through satisfied customers. Some benefits for our customers include (a) Being able to deliver on their goals through a reliable partner in your organization; (b) Provide career-growth and expansion of their current individual and divisional roles and responsibilities. Easy to implement – last but not the least, the process needs to be simple and adoption-ready, which means to be straightforward in explanation, intuitive in practice, and verifiable in compliance. Set-up and manage expectations – a strong focus during the initiation and planning stages to ensure everyone is on the same page is the ONLY way you can bring project success. Primary deliverables here include the Project Charter and the Project Management Plan. Communicate, communicate, and communicate – defining, planning, and implementing the communication structures go a long way to manage conflict and keep everyone abreast of the project status. Primary deliverable here is a Communication Management Plan that defines what, why, when, and how the project information is distributed. 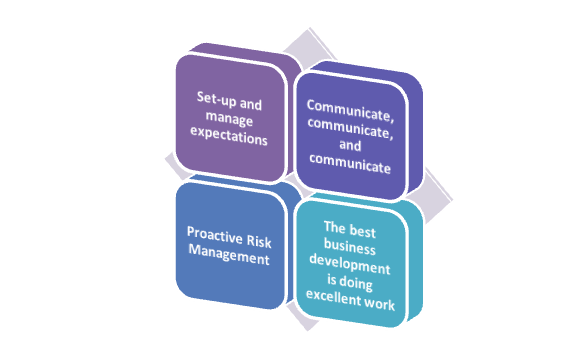 Proactive Risk Management – paying constant and structured attention to internal and external factors that can derail a project provides for a platform for their early detection and resolution. Primary deliverable here is a Risk Management Plan that defines the project risk management methodology, the risk register/inventory, and the risk management meeting schedule. The best business development is doing excellent work – our reputation precedes us. Concentrate on making sure that our service delivery is exceptional, resulting in expanding existing client engagements and positive past performance references. On Luxury vs. premium – so relevant to consulting too!